Patrik Lindström EBM, Futurepop The last thing we heard from Covenant was when they released 'Northern Light' in 2002. Now four years have passed and new material from Covenant is something that many have longed for. A taste of the album has arrived in the shape of an EP named 'Ritual Noise'. 'Ritual Noise' contains, besides four versions of the title track, "The Island" and "XRDS" which are two unreleased songs. "The Island" is a heavy and instrumental song. "XRDS" is a monotone song with high quality that could easily be a part of a full length album. Three versions of "Ritual Noise" are self produced mixes in the forms of "Edit", "Main Version" and "Version 5", but the fourth and last version is a remix by the new star, in our genre, Terrence Fixmer. You easily hear, in the beginning of the song, that it is Mr Fixmer who is behind the remix. "Ritual Noise", regardless the version, are nothing new in anyway, which is very good. It is Covenant all the way but if you compare with 'Northern Light' you may hear that the sound have hardened a little bit, but that is just a feeling I depend on rather than my hearing. Danceable beats and a dominant Eskil, exactly what we are used to and what we wish for. I can honestly say that 'Skyshaper' are one of the biggest and most eagerly awaited releases during 2006 and I promise you a review of the album the same day as it is officially released, which will be in the first day of mars 2006. Keep that date in mind. 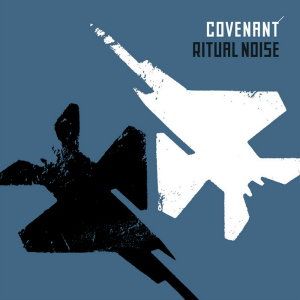 The last thing we heard from Covenant was when they released 'Northern Light' in 2002. Now four years have passed and new material from Covenant is something that many have longed for. A taste of the album has arrived in the shape of an EP named 'Ritual Noise'.